SOCHI, May 18. /TASS/. The Russian PM Dmitry Medvedev suggested the candidates for ministers at the meeting with President Vladimir Putin. Putin supported the candidacies proposed by Medvedev. Medvedev has suggested that Anton Siluanov remains the Finance Minister. Siluanov will also become the first deputy prime minister. Siluanov was earlier appointed as the Finance Minister on December 16, 2011. He started working in the Finance Ministry as the economist in 1985 and progressed to the office of deputy minister in 2003. The prime minister suggested Vladimir Medinsky retains his position as culture minister. Medinsky, 47, has been serving as culture minister since May 21, 2012. He graduated from Moscow State Institute of International Relations in 1992, and was a member of parliament in 2003-2011. Medinksy entered the bureau of the United Russia Party’s Supreme Council in 2017. Sergey Lavrov should retain his position as the Russian foreign minister, according to Medvedev. Lavrov is one of the most experienced ministers in the Russian government, which stepped down on May 7. He has served as the foreign minister since March 9, 2004. Lavrov, 68, was deputy Russian foreign minister in 1992-1994. In 1994-2004, he served as Russia's permanent representative to the United Nations in New York. Medvedev suggested reappointing Veronika Skvortsova as the Healthcare Minister. Skvortsova was appointed as the healthcare minister on May 21, 2012. She is the Doctor of Medical Sciences and the distinguished scientist of the Russian Federation. Tyumen Region Governor Vladimir Yakushev will become Minister of Construction, Housing and Utilities. Mikhail Men is currently the acting construction minister. He has headed the ministry since November 1, 2013. Vladimir Yakushev was born in the city of Neftekamsk in 1968. In 1993, he graduated from the Tyumen State University majoring in law, and in 1997 he received second higher education there majoring in banking and finance. Maksim Topilin should be reappointed as Russia’s Labor and Social Protection Minister, Medvedev said. Topilin has served as Minister of Labor and Social Protection since May 21, 2012. Medvedev suggested the candidacy of Dmitry Patrushev to the office of the Minister of Agriculture. Patrushev, the elder son of Secretary of the Russian Security Council Nikolai Patrushev, is serving as the Chief Executive Officer of the Russian Agricultural Bank since 2010. He is the member of Gazprom Board of Directors from 2016. Konstantin Noskov, who currently heads the government’s analytical center, will be the Russian Minister of Digital Development, Communications and Mass Media. Noskov was the head of the Analytical Center under the Russian Government from November 2012. Alexander Kozlov, the current Governor of the Amur Region, will become the Russia’s Far East Development Minister. Kozlov was elected as the Governor of the Amur Region in 2015. Medvedev suggested appointing Yamalo-Nenets Region Governor Dmitry Kobylkin as Minister of Natural Resources to replace Sergei Donskoy. Donskoy has been head of the Ministry of Natural Resources since May 21, 2012. Kobylkin is 46 years old. He was born on July 7, 1971, in the city of Astrakhan. In 1993, he graduated from the Ufa Institute of Petroleum as mining geophysicist. In 2003, he graduated from the Institute of Professional Retraining at the Ural Academy of State Service majoring in state and municipal administration. He became Yamalo-Nenets Region Governor in 2010, and in 2015 he was re-elected to this position. Sergei Shoigu will retain his position of Russia’s Defense Minister. Shoigu is the most experienced member of the Cabinet, which stepped down on May 7. He headed the Ministry of Civil Defense, Emergencies and Disaster Relief from 1994 to 2012 and briefly served as Moscow Region Governor. In November 2012, Putin appointed him Russia’s Defense Minister. Maksim Topilin should be reappointed as Russia’s Labor and Social Protection Minister, Medvedev suggested. Topilin has served as Minister of Labor and Social Protection since May 21, 2012. He held the office of the Deputy Healthcare and Social Development Minister in 2008-2012. Medvedev has suggested appointing Olga Vasilyeva Minister of Education and Mikhail Kotyukov - Minister of Science and Higher Education. Two new ministries were established in accordance with the relevant decree issued by Russian President Vladimir Putin instead of the former Ministry of Education and Science led by Vasilyeva since August 2016. Concurrently, the head of state abolished Russia’s Federal Agency for Scientific Organizations (FASO), which Kotyukov headed. First Deputy Minister of Transport Evgeny Ditrikh has been presented as a candidate to the minister’s office. Ditrikh has served as the First Deputy Minister of Transport from October 2015. He led the Russian transport supervision agency before. The prime minister proposed that acting Sports Minister Pavel Kolobkov retained his post in the new government. ​Kolobkov, 48, was appointed the Russian sports minister in October 2016 replacing Vitaly Mutko, who was appointed at that time a deputy prime minister to oversee the issues of sports, tourism and youth affairs in the Russian government. Vladimir Kolokoltsev should retain his position as Russia’s interior minister, Medvedev suggested. Kolokoltsev, 57, was appointed as the interior minister in May 2012. He served as Moscow's police chief from 2009 to 2012. Yevgeny Zinichev is nominated to be emergencies minister. Zinichev, 51, is supposed to replace Vladimir Puchkov. He joined security agencies in 1987 and was appointed as deputy director of the Russian Federal Security Service (FSB) in November 2016. In 2015-2016, Zinichev served as head of the FSB branch in the Kaliningrad region. In July 2016, he was appointed as acting Kaliningrad Region Governor but resigned in October of the same year. Medvedev has suggested Denis Manturov remains the country’s minister of industry and trade. Manturov, 49, has been serving as minister of industry and trade since May 21, 2012, while he first entered the ministry in 2007. Alexander Konovalov should be reappointed as Russia’s justice minister, according to Medvedev. Konovalov was appointed as Russia’s justice minister in 2008 and reappointed to the position in 2012. 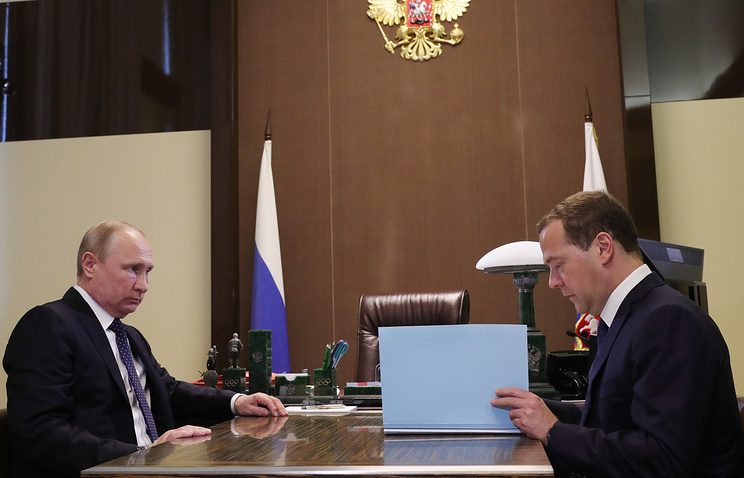 The prime minister suggested the candidacy of Dmitry Patrushev to the office of the Minister of Agriculture at the meeting with President Vladimir Putin on Friday. Patrushev is currently the Chief Executive Officer of the Russian Agricultural Bank. Medvedev suggested keeping Alexander Novak in the office of the energy minister. Novak is in charge of the Russian Energy Ministry from May 21, 2012. He served as the deputy finance minister of Russia in 2008-2012. Maxim Oreshkin will be reappointed the Minister of Economic Development. Oreshkin was appointed as the Minister of Economic Development on November 30, 2016. He was one of the youngest ministers in the previous government. Oreshkin served earlier as the deputy finance minister from 2015 to 2016.